Notes: Castle is found off Covington Road to the north of Thankerton which is accessed off the A73. No car parking but on-road parking is possible in the vicinity. The ruined remains of a Tower House and Dovecot within the grounds of a working farm. Adjacent earthworks might be the remains of an earlier motte. Covington Castle is a fifteenth century Tower House built by the Lindsay family and occupied for two hundred years. 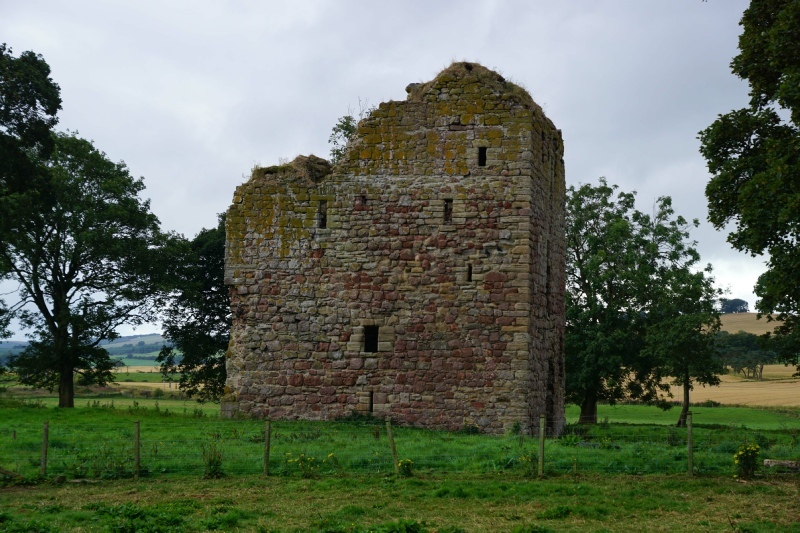 They had acquired it from the descendants of the original owner, Colban, a Flemish mercenary who had settled in Lanarkshire in the twelfth century. The first mention of Covington dates from the twelfth century when the site was owned by Colban, a Flemish mercenary who had settled in Scotland during the reign of Malcolm IV (1153-65). The area derived its name directly from its new owner. It was originally referenced as Villa Colbani (Colban's village) which later became Colbaynistun and, by the fifteenth century, morphed into the modern Covington spelling. Other than the name, little is known about these early days of the settlement. It is possible Colban raised a motte on the site as was done by contemporary immigrants (for example at nearby Coulter) but only limited evidence survives of this now - a raised terrace, part of sixteenth century formal gardens, may have been converted from a former mound. Covington was held by the descendants of Colban, who took the surname Colbanstoun, until the early fourteenth century when they were acquired by Robert de Keith, Marischal of Scotland. In 1368 it passed to the Lindsay family and they built the fortification seen today, a ruined tower house, around 1442. A four storey structure it consisted of a vaulted basement, a Great Hall on the first floor and accommodation above. A turnpike stair allowed access to all levels. The tower was constructed with a rubble masonry core, over 3 metres thick, faced with dressed stone. The site was surrounded by earthworks including a ditch. The Lindsay family retained Covington until the late seventeenth century. Their tenure saw formal walled gardens established around the Tower House, possibly re-modelling earthworks from an earlier fortification. A Dovecot, still standing, was built in the sixteenth century in the corner of the gardens as a source of meat. The castle was sold to Sir George Lockhart in 1679 and at some point thereafter it fell into ruin.